Have you ever tried playing tennis with that devilish tennis ball machine that keeps shooting balls at you while you have to return them really fast? Now, imagine doing all that while balancing on a monocycle. On the edge of a mountain. With your eyes shut. I guess that’s how customer support can feel sometimes – requests from customers are just coming from everywhere. You log into your company’s Facebook page and see 2-3 new messages there, you go to Twitter and someone has already complained about your service there. You open your inbox and it’s stuffed with inquiries from your customers, business partners, parents, cat and whatnot. Got that suffocating little feeling already? That overwhelming feeling of not being able to keep up with the pace? Now, that is exactly what help desk tools are willing to solve for you. They want to take all these communication channels, unite them under one dashboard and give you everything you need to handle incoming requests effectively. And two most famous help desk tools out there are Zendesk and Freshdesk. Companies that decided to switch to ticketing systems for their customer service often face this ‘Zendesk vs Freshdesk’ conundrum. They both are extensive in their customer service features, have affordable pricing plans for different budgets, provide pleasant onboarding experience and, overall, are quite great in what they do. So how does one make a choice in a situation like this? There are no two ways about it. Let’s compare Zendesk and Freshdesk and let’s do it as meticulously as it gets. Freshdesk feels simpler and easier to use while costing less if you choose to buy the full package. Zendesk wins by integrations and in rare cases by features, but feels like a bit disconnected toolset for huge departments rather than for small businesses. If customer service tools were Italian mafia, Zendesk would be its godfather. In other words, it’s one of the oldest and most comprehensive help desk tools on the market. Founded in 2007 in a small loft somewhere in Copenhagen, Zendesk is the oldest among top customer service tools on the market these days. The very idea of it arose from the complicated old school ticketing systems. They worked like a mess back then and Zendesk’s mission was to fix all that was wrong about them. Fast forward 12 years, and Zendesk is one of the most extensive help desk tools and is still going strong. I was reading this article on Hacker News. This article was about Zendesk raising their prices 60 – 300% and how their users were unhappy about it. That comment was like a slap on my face. Here was an opportunity sitting right in front of me. Good news for all money-saving fellows out there. Both Freshdesk and Zendesk offer some of their tools for free. Sure, they are limited in many ways, but heck it, it’s free stuff. For instance, you can choose either a live chat or a call center from Zendesk and get it for free. With Freshdesk you get a rather cutdown version of their entire set for an unlimited number of agents. You can also choose Freshchat for free if you choose to. Alternatively, you can go and sign up for their free trials and test any of the paid subscriptions. 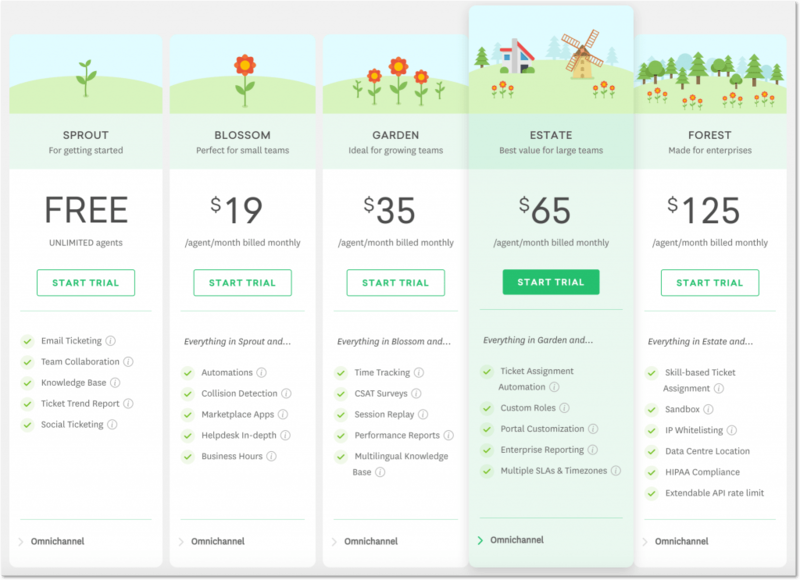 Zendesk offers a 30-day trial (which is rather a long trial period for SaaS companies), while Freshdesk’s plans are available for a 21-day trial (not too bad as well). But what if you’re willing to pay for tools you use? 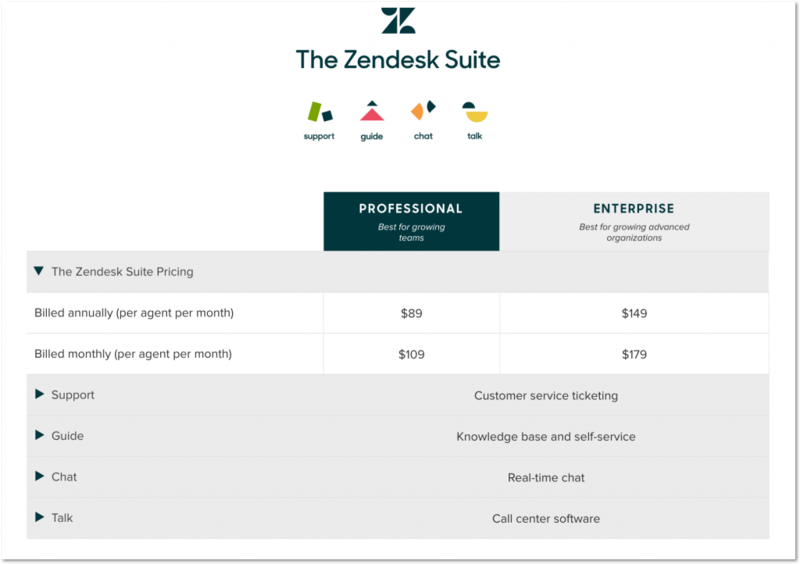 You can go and choose the Zendesk Suite which will cost you $109 per month for the Professional subscription and $179 per month for the Enterprise one. Or you can pay annually and save 35% on them. What is great about Zendesk is that you can also purchase any of their tools separately. If you’re a small business owner who doesn’t want to pay for redundant features, Zendesk is you guy. Pay as little as $9 per month and get yourself the most basic helpdesk tool by Zendesk. Or spend $19 each month on their live chat. Or choose any other tool and pay just for it – the choice is yours. When bought as a whole, Freshdesk is more affordable than Zendesk. Their most basic subscription plan costs only $19 per agent per month if billed monthly, while their most expensive plan is $125 per agent per month (compare that to $179 per month for Zendesk’s Enterprise). I’ll be honest with you. If I had to choose between Zendesk and Freshdesk right this moment, I wouldn’t know which one is better. It is widely thought that Zendesk is the most comprehensive help desk tool out there. They have everything a customer support team needs and more. But the thing about Freshdesk is that it’s every bit as good a tool. Zendesk converts all interactions with customers be they via phone, chat, email, social media, or any other channel into tickets. There’s a plethora of features to help bigger teams collaborate more effectively. Zendesk helps your customer support team gather all issues from disconnected channels and centralize them into a prioritized and actionable list. Customer service teams get a real-in time view of how each particular issue is being resolved with an easy issue tracking system. They get to see some kind of an activity log and a name of an agent handling it. What also makes Zendesk stand out from the competition are their reports. They provide the most detailed reports on everything – like how quickly service representatives resolve tickets and the development of a ticket’s status from open to close. To be honest, I’m not the biggest fan of Zendesk’s chat widget because of its limited customization options and outdated design. I mean look at it, it’s like 00s all over again. Still, in terms of functionality, it has most of the necessary features like shortcuts (saved responses), automated triggers and live chat analytics. The Guide tool from Zendesk is very rich in features – from localizations to bot integration to feedback forums. Basically, you can create new articles, divide them by categories and sections – make it a high end destination for customers when they have questions or issues. 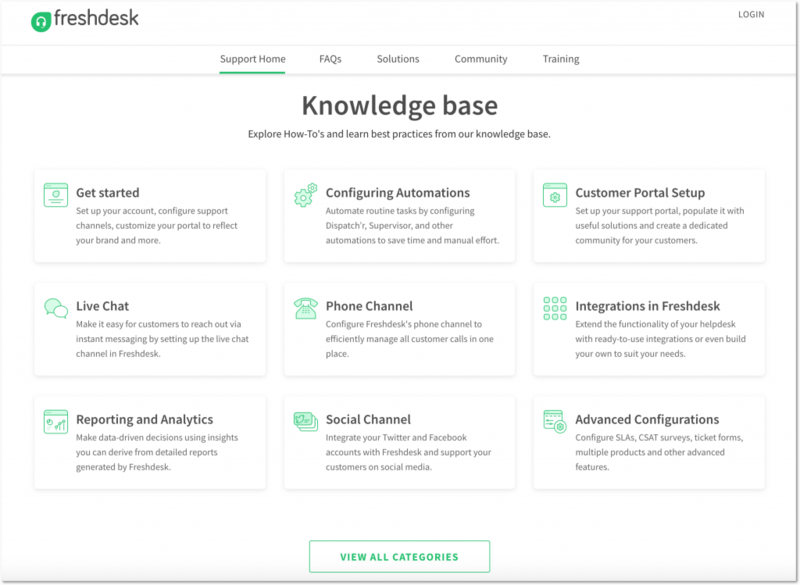 Zendesk also has the Answer Bot, which can take your knowledge base game to the next level instantly. It can automatically suggest your customer relevant articles reducing the workload for your support agents. And it’s multilingual, too. It is the very core of Freshdesk’s functionality. Its ticketing system works like a charm and is really pleasant to deal with. Basically, every email, chat, or call is converted into tickets in Freshdesk’s dashboard, where they can be prioritized, assigned or grouped. And yeah, all this can be done automatically. Freshdesk likes emphasizing on its Team collaboration features – like auto assigning tickets to the right person or real time insight into who’s already managing a given ticket, etc. It’s also possible to integrate your Twitter and Facebook pages with Freshdesk and receive customers’ requests from there, too. You can automate the routine tasks in your help desk such as setting priorities, following up on tickets and other operational tasks that help you run your support. All in all, I was pleasantly surprised by how easy it is to work with Freshdesk’s ticketing tools. It goes like this. Freshdesk is actually just one tool (or rather a set of help desk tools) from the Freshworks family. So if you want a live chat for your website, you should register for another tool called Freshchat. Its pricing varies from $0 to $49 if paid monthly. If we talk about Freshchat appearance, I like it much better than Zendesk’s live chat widget. It looks simpler and more modern. Freshchat allows triggered and in-app messages inside its chat widget as well as tracking user events (e.g. last visited pages) and properties (e.g. location, browser language). Freshdesk provides a nice and clean help center feature. And it’s multilingual, too (meaning you can provide a translation of your articles in any language you need). Probably, the nicest thing about their self-service tool is that it includes some search engine optimization features to help you prepare your content for indexing by Google. Except for that, I didn’t find anything particularly outstanding about their self-tservice tool. It’s nice and clean. It’s not as developed as Zendesk’s Guide. Let’s put it straight. I liked Freshdesk better right after I signed up for their toolset and they gave me access to the dashboard. And here’s why. You need time to understand Zendesk. Yeah, that’s in a nutshell. While it’s true that Zendesk has built a great onboarding process and provides you with helpful tips on every step of your journey, I’d still want to get started right away rather than struggling to understand how things work there. Also, while working with Zendesk dashboard, you find that you need to open their tools in separate browser tabs. That is definitely not a thing for smaller customer support teams. It’s no secret Freshdesk is shouting from the housetops that their interface is more intuitive and easier to set up and dive right into it. And well, in all honesty, that is my impression, too. I liked how Freshdesk is built and how they onboard newcomers. When you sign up for their tool for the first time, you’ll get to see a small welcome video from their CEO and then will be offered a 20-minute demo where they team explains the basics of Freshdesk. And this video is more than enough to get you started. Zendesk’s own customer support is what I really liked about them. I asked them a question in their live chat and got an instant reply – nice and right to the point. When you leave a message in Freshdesk’s live chat, you can always see an indication of how fast you can expect their answer. When I was leaving mine, it said ‘Currently replying in under 15 minutes’. 3 hours later – and I’m still waiting for someone to get back to me. If you ask me, I’d go with Freshdesk. It’s just that I liked their dashboard the minute I logged into it. And I can’t dismiss this feeling. It’s also cheaper making it a more obvious choice for smaller companies. Zendesk can be a great choice for bigger (read: huge) companies with all its tools, departments features and stuff. Alternatively, I’d recommend you to look into more unified alternatives – like HelpCrunch. With HelpCrunch you get a modern fully customizable live chat backed by help desk features like assigning tags and statutes, adding private notes for your colleagues, re-assigning customers’ requests from one agent to another, etc. Test any of HelpCrunch pricing plans for free for 14 days and see our tools in action right away. And we also have a free subscription plan.